It is our belief that the religion of Muhammad, peace and blessings of Allah be upon him, is the true religion and Muslims the world over need to become acquainted with the true Islam in order to promote its message to others. 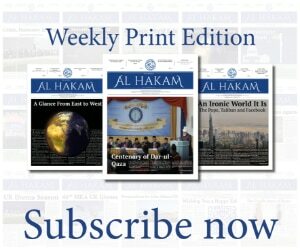 For this reason, The Weekly Al Hakam will provide insight into the teachings of the Quran, the Ahadith and the beliefs of the Ahmadiyya Muslim Jamaat. Its name is derived from the original الحکم (Al Hakam) that was launched in the time of the Promised Messiahas in 1897 and remained until 1952. Initially it was published from Qadian and its purpose was the same as the present Al Hakam. Insha-Allah, Al Hakam will also endeavour to keep Ahmadis around the world connected and updated with important information pertaining to the Jamaat and important announcements on behalf of various departments. Thus, Ahmadis are encouraged to read the newspaper regularly so that they remain informed about the latest information about the Jamaat.